When Buffalo State Theater Department lecturer Patrick Moltane was an undergraduate at the University of Michigan in the mid-1990s, he studied with playwright OyamO (Charles F. Gordon). Around that same time, OyamO produced his groundbreaking play I Am a Man, which focuses on black sanitation workers’ strike for equal pay in Memphis in February 1968. Their walkout served as a flashpoint of the civil rights era, and riots ensued. Less than two months later, on April 4, famed civil rights leader the Rev. Dr. Martin Luther King Jr. was assassinated. 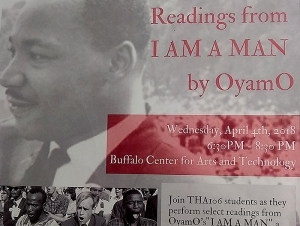 As the nation commemorates the 50th anniversary of King’s death, Moltane decided to celebrate his life through three staged readings of I Am a Man on campus and in the community. “Better than mourning Dr. King, we choose to celebrate his life with a powerful piece of theater,” Moltane said. In February, he held auditions open to all Buffalo State students. The 10 students he selected will perform the staged readings of Act I on Tuesday, April 3, and Act II on Thursday, April 5. Both will take place from 12:15 to 1:30 p.m. in the Flexible Theater. An additional five students will handle stage direction, management, and dramaturgy. It is free and open to the community. Separately, 40 students in Moltane’s Introduction to Theater service-learning course will read short excerpts from the play on Wednesday, April 4, from 6:30 to 8:30 p.m. at the Buffalo Center for Arts and Technology (BCAT). Students who participate in BCAT program and adults involved with WNY Peace Makers and the Poor People’s Campaign will participate. While some Buffalo State students will do the readings, others will lead the audience in a follow-up roundtable-style discussion. Another group will document the responses. While this is a 50th-anniversary tribute, the issues that King heralded and OyamO brought to light are still extremely relevant, Moltane said. 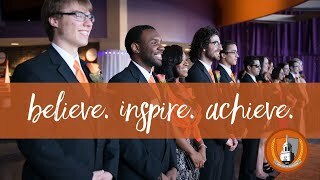 And that is what the Buffalo State students are trying to accomplish.